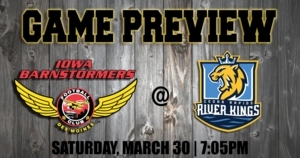 DES MOINES - The Iowa Barnstormers (3-0) look to continue their undefeated season as they travel to take on in-state rival, the Cedar Rapids River Kings (1-3) on Saturday, March 30. Kickoff is set for 7:05 p.m. CST at the U.S. Cellular Center. The Barnstormers narrowly escaped the Nebraska Danger on the road last week, winning 58-55. In a game that saw quarterback Daquan Neal throw for four touchdowns and run for three, perhaps his biggest came late in the game, down by four. With 18 seconds remaining, Neal escaped pressure in his own end zone and heaved a long ball to receiver Connor Hollenbeck for the go-ahead score. Kicker Nathan Criswell was named IFL Special Teams Player of the Week for his efforts against the Danger. He nailed a 28 yard field goal and made all seven of his extra point attempts. Defensive back Jourdan Wickliffe led the defense with 13 total tackles. The River Kings were on a bye week for week five, but experienced a home loss against the Quad City Steamwheelers 58-36 in week four. Cedar Rapids struggled on offense, but did have a bright spot in receiver Marquel Wade, who caught five balls for 83 yards and two touchdowns. The only win for the squad came in week three, when they beat the San Diego Strike Force 65-48. The River Kings are looking to get back in the win column this week. The 3-0 start for the Barnstormers is the best start in head coach Dixie Wooten’s time as head coach. The squad is hoping to keep their undefeated season alive this Saturday. Fans can tune in to the game live on YouTube starting at 7:05 p.m. CST. The Iowa Barnstormers will return home to Wells Fargo Arena on Saturday, April 6 to once again face the Cedar Rapids River Kings. Kickoff is at 7:05 p.m. It's 90's night! Grab your fanny packs and get ready for nostalgia as the Barnstormers jam out to 90's tunes and re-live some of your favorite fads! Tickets are available now, call (515) 633-2255 or visit www.theiowabarnstormers.com.